bananaquilts: Some sewing book reviews amongst other things. Some sewing book reviews amongst other things. As I write this, I am eating a new desert I just invented. It is Cafe Grande icecream, which contains choc covered scorched almonds, and grande marnier flavour, with Caramel Crown biscuits. Mmm. I thought it up for hubby but I tried some too. At the same time, I am watching this crazy cool program on tv about two guys who visit hoarders and check out what's in their sheds. It is incredible! What an eye-opener. I have to overcome my hoarding instincts lest I end up on this show. I have found out (by pressing the right button on the remote) that it is called "American Pickers". I would love to see an Aussie version of this show, they could start with my Pa! 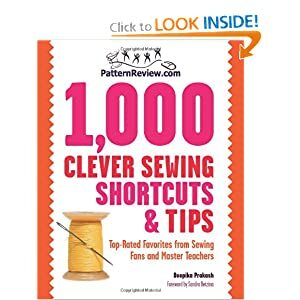 I borrowed "1000 clever sewing shortcuts and tips", by Deepika Prakash of patternreview.com fame. Unfortunately, it is time to return it to the library and I have not been able to try out the tips! Someone else has requested it, grrr. There are tips to help you organise your sewing room, cut out patterns, cut fabric, sew nicely, deal with different fabric types, choose the right pattern and make it fit your particular body shape..you name it, there is a tip for it. All of these tips have been submitted by the loyal readers of patternreview.com. I am a member of this site, but so far I have not managed to post a review. I do like to read peoples' recommendations though, and my favourite part is where people submit photographs of their finished designs. This is so much better and more accurate than looking at the photos on the pattern envelope. I really enjoyed learning from the wisdom of other sewers, and I will be requesting this book again so that when the next person's finished it, it will come straight back to me. The other item I have to take back that I am not ready to part with yet is Paul Kelly's greatest hits albumn, "Songs from the South", it rocks! 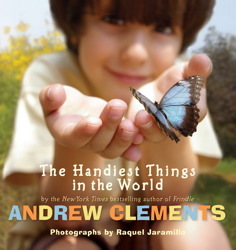 "The Handiest Things in the World" by Andrew Clements, is a sweet photo picture book about hands. The frontispiece shows a collage of photographs of hands, holding, touching ,scooping, spraying, scooping, tying...pretty much anything your hands can do is depicted here. It is so bright and colourful, an eyecatching way to start the book. The text is a poem that runs throughout the book, each double page on a separate subject. The photos by Raquel Jaramillo are clear and full of activity. I am sure this book would be a great hit with pre-schoolers. I really liked it. I recently picked up a second hand copy of "The Seventh Pebble" by Eleanor Spence. It has a stamp on the title page that says "Village Creek Primary School Library" but it does not appear to be a library book - no creases, no jam stains, no marks where sticky stuff has been ripped off. Hmm. Maybe they didn't read any books at that school? I am sure I have read this before, in high school, and after I've read it again I will write you a review. I don't think it is in 1001 kids books to read before you grow up, but it probably should be in 1001 Australian kids books to read! "Sew Eco" by Ruth Singer is a great little sewing book. For starters, hasn't she got a great name for a sewing author? She starts by explaining what is eco sewing, and provides useful information about how to source fabrics and supplies that don't use lots of chemicals, come from far away or create problems for the environment. Then she writes about how to take care of old fabrics, and re-use garments and other fabric items to make new things. Finally the book has instructions for making chair covers, pin cushions, a corsage and even a skirt. I have read a great many sewing books about reusing materials, you know, all of that "shabby chic s**t", but this is the first one that has explained in great detail about how to find earth friendly fabrics and what to do with them when you do find them. Truly a great resource and a reference book.